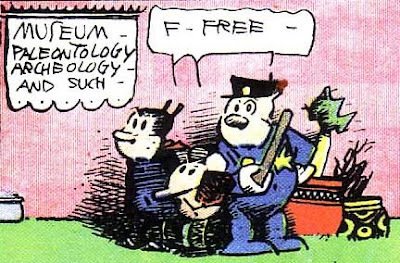 Our heroes: Krazy Kat, Ignatz Mouse (with brick) & Officer Pupp. 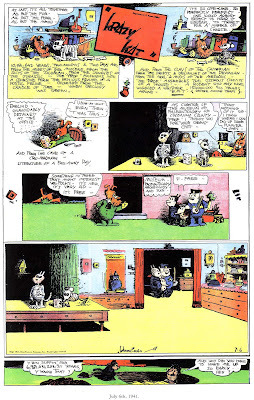 The July 6, 1941, colour Sunday page (below) comes from arguably the greatest comic strip ever (I would agree), “Krazy Kat”, taken from the Fantagraphics collection, “Krazy & Ignatz: A Ragout of Raspberries”, by George Herriman. CLICK TO ENLARGE AND READ IN ALL ITS GLORY. Krazy Kat was set in the mythical and ever changing desert landscape of Coconino County somewhere more or less in Arizona, and the stark beauty of its landscapes informed the strip and its inhabitants. Pretty much every strip revolved around the desire of a mouse (Ignatz) to bean the Kat (Krazy) with a brick, and the need of the dog (Officer Pupp) to prevent this and put the mouse in jail. Complicating matters is the fact that Krazy is smitten with Ignatz and takes being beaned by the mouse as a sign of affection, much to the chagrin of Pupp who is sweet on Krazy -- ah, the sad beauty of life. Herriman was part cartoonist & part poet, and ranks up there with Walt Whitman and Mark Twain as a genius storyteller and observer of the human condition. The strip ran from the 1920’s to 1944, always exclusively in Randolph Hearst’s newspapers. The strip can look somewhat crude to the uninitiated eye, but its charm will win over the discerning mind. In this episode the eternal story of [Mouse + Brick + Kat] plays out even in the fossilized bones of the past.